Re-Play is a great line of recycled tableware for children. Re-Play is made from recycled milk jugs in the USA. 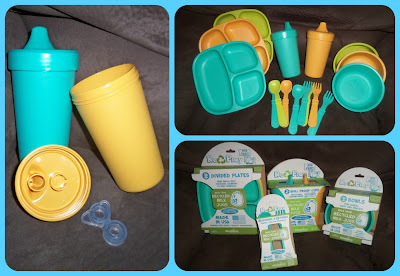 They are BPA free, Phthalate free, and PVC free choice. The plastic used is recycled through a unique process that the FDA has approved for food contact. The plastic is specially selected and cleaned, to meet FDA strict purity standards. Re-Play goes to another step and has each product in each color third party tested to assure the final product is as buyers expect and meets all FDA requirements for food contact. The Re-Play come in 4 colors, pink, orange, green, and aqua. The Re-play tableware are dishwasher safe. I was sent a variety of Re-Play tableware including 8 pack of utensils, 3 pack of bowls, 2 pack spill proof cups, and 3 pack of divided plates. The utensils are made up of 4 spoons and 4 forks. The spoons have a deep scoop and the forks have rounded tips. The handles are perfect size for toddlers and preschoolers. I was a little concerned that the forts would not poke food well, but I was wrong. They work great. The bowls are deep and thick. They hold plenty of food and since they are deep the sides are higher and that allows for less tipping and spills. Also, with the deep walls it is easier for children to use learn to use utensils with less frustration. The spill proof cups have a one piece silicone valve. The valve helps to eliminate leaks. The only problem I have had with them is the valve is easy to reverse making it hard to get the liquid out. I did this once to Jayden, but of course its an easy fix to just open it up and turn it around the correct way. My favorite of the items is the divided plates. There are 3 sections that also have deep walls like the bowls. There is one larger section and two smaller ones. Again these plates are very thick and I am happy that I don't have to worry if they are dropped that they will break. I don't know what it would take, but I'm sure it would take a lot to break these dishes. We have used the Re-Play tableware many times since we received them. The tableware has become my go to for Jayden. We have used them for breakfast, lunch, dinner, and snacks. Jayden loves the size is perfect for him. When we first received these Jayden thought they were for his play kitchen. They do resemble some of Jayden's play dishes. You can purchase the sets in the Aqua or the Pink. They also carry a try it out pack where you get one of each item to try and see if you like it. Replacement valves for the sippy cups are also available, which is great because these are things that are easily lost or eaten by the garbage disposal. I was happy to find that Re-Play tableware can be found at many WalMart locations. Make sure you follow Re-Play on Facebook and Twitter. Win it: One (1) Arizona Mama Reader will win a Re-Play Set of plates and utensils. Thank you to Re-Play for sponsoring this review and giveaway. For my daughter. I would pick pink! I like that they are made from recycles material and are BPA free! This would be for my grandson, so I would choose the Aqua set! I learned Re-Play is really made from Recycled Milk Bottles! I would pick the aqua set for my granddaughter. I like their 3 Pack of Divided Plates with especially deep walls for toddlers! I'd pick Aqua for the next toddler in the family. Aqua for my 2 yo son!! I really like their spoons & forks set. Such a great idea and I love they are made in the USA. These would be for my 3 year old daughter. I would go with the Aqua set. I like all the bright colors! I learned that the total miles Re-Play travels from recycled material to finished product is 940 miles...11,000 miles less than conventional Chinese-made products! This would probably be for my niece. I would choose the aqua set! For my next baby - and I would pick aqua because we are having a "surprise" this time! I learned that this Tableware is green because it will last and is rugged and durable. This would be for my little grandchildren who I take care of and I would choose the Aqua! It would be for my wife and her art classes and I would pick aqua. I think its awesome they are really made from recycled milk jugs! this would be for my son, age 2 yrs. I'd choose aqua! This would be for dd and I'd get it in the pink. I learned that Replay is made in the USA! This would be for my grandson Carter! I would pick the Aqua. I love that they are made in the USA and that they have nice looking sippy cups! I like the Spill Proof Cups. This would be for m 2 year old son, so I'd like it in aqua. I like the Spill Proof Cups, and I learned that Re-play is really made from Recycled Milk Bottles! This would be for my 3 year old son and 11 month old daughter, I would choose Aqua! This would be for my youngest son, and I choose Aqua. I like the 2 pack of Spill Proof Cups. I love that it is a product that is made in the USA! I would get the aqua set for my boys. love eco-friendly products. These are great! I would get the pink set for my girls.